Hello there, today I have a card to share that I made for my Dad for Father's Day. I used Hero Arts products for this one, I kept it simple but I do like how it turned out. I started off by creating my background. I stamped the Irregular Grid Bold Prints on to a piece of watercolour paper using Versamark Ink. I then applied clear embossing powder and heat set. I took various shades of blue and green Dr Ph Martin's Hydrus Watercolor and added them to the panel. I mixed them together on the panel with water and then set it aside to dry. 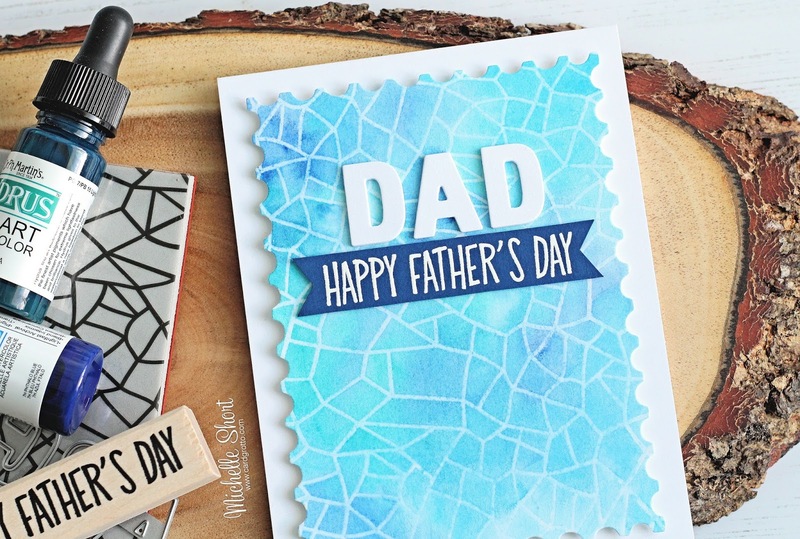 I took the Father's Day sentiment from the Best dad wood block stamp set and stamped this on to blue cardstock using Versamark Ink. I applied white embossing powder and then heat set. I cut this in to a strip and then cut banner edges on to the sides. I took the Luggage Tag Alphabet Frame Cuts and cut the letter A three times and the D six times. I stacked these up so that they were three layers high each, using liquid glue. Once the background piece was dry, I die cut it using one of the Nesting Postage Stamps Infinity Dies. I added this on to a white A2 card base with foam tape. I then added the DAD letters with liquid glue and the banner piece with more foam tape. Thank you so much for visiting me today. We seem to be having a bit of heat wave here in London at the moment. I know I shouldn't complain since it is usually raining (haha!) but I am not good with the heat. Where are those ice lollies?! I hope you have a great rest of the weekend! 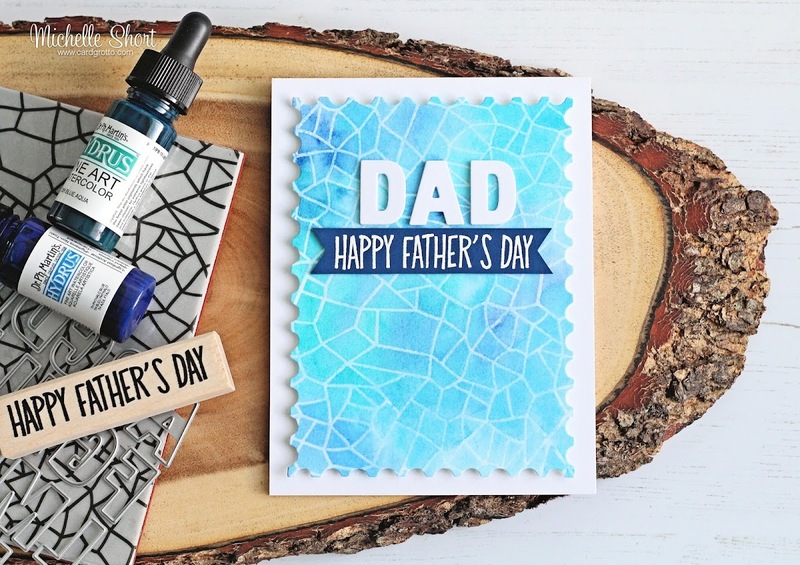 Love your sweet Father's Day card! What a gorgeous blue background! 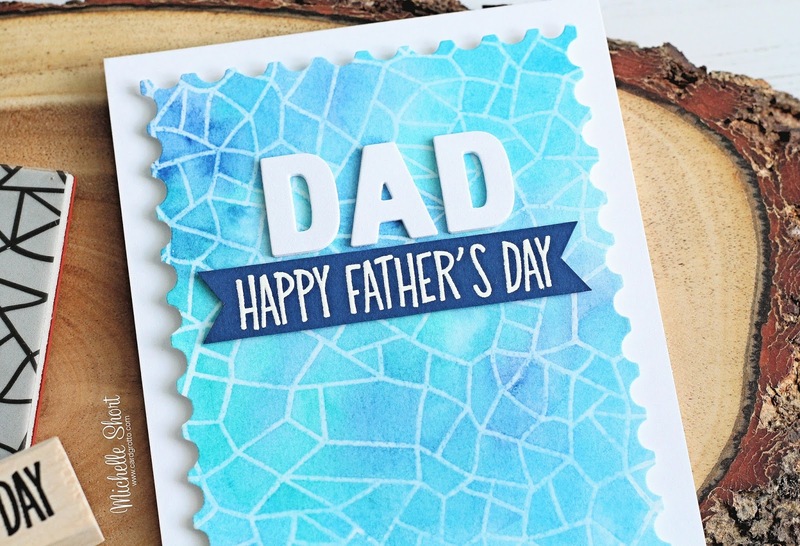 Simple is always best for men's cards & this one is perfect! Oh this is wonderful! Such an awesome masculine design.